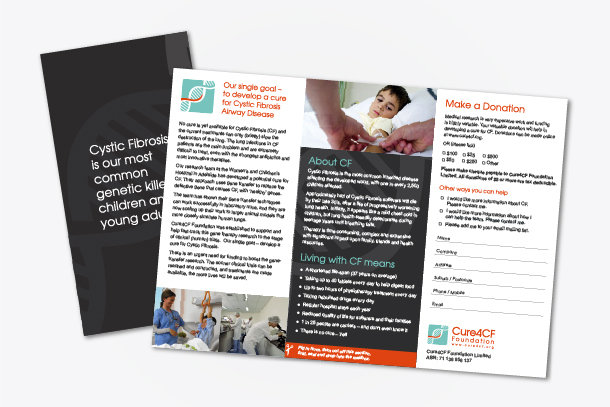 In October 2007, I was privileged to be involved in the launch of a new fund raising organisation called Cure4CF Foundation. 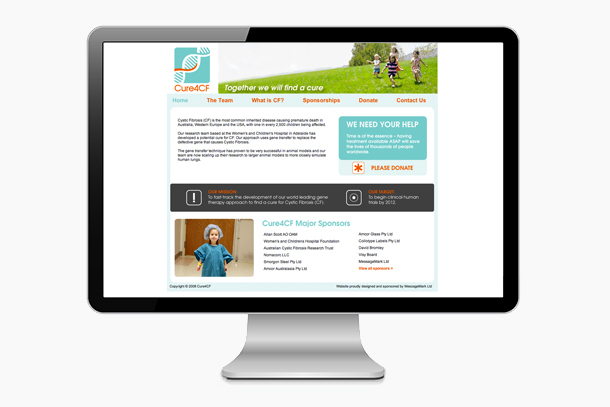 My support to Cure4CF involved creating a new identity and developing a marketing plan to help raise the non-for-profit’s profile. Cure4CF is simply that. The ultimate goal is to find a cure for Cystic Fibrosis. A small Gene Therapy Research team based in Adelaide, South Australia are making amazing progress towards a cure – they just require ongoing financial support to fund their incredible work. The Cure4CF logo was created to feature a stylised double helix to represent the genetic research. This simple clean 2 colour logo is fresh, yet still maintains a corporate feel. The colours were selected to resemble the overall brand essence and goals of the organisation. Orange – inspirational, yet portraying a sense of urgency / Light Blue – Symbolising life, hope, water, breath and laboratory. The orange line running through the double helix represents pinpointing a cure for Cystic Fibrosis. The font ‘Avalon’ used in the Cure4CF text was selected to compliment the clean lines of the helix logo. Landscape and portrait options of the logo were also created to allow flexibility across many future marketing applications.